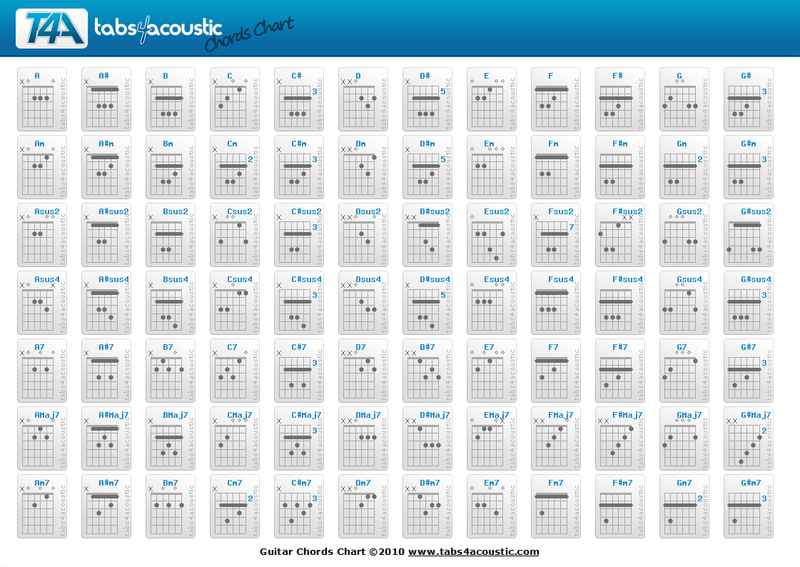 As a beginner, you may look at reading and playing guitar chords as something that is foreign to you. However, with the help of a chord diagram, you can easily transcribe a chord, forming written music. Also, as you get to familiarize these things, you will eventually find yourself skilled later on. After all, patience is a very important quality that you need to have if you want to be a skilled guitar player. The top of the diagram is the chord name, which can be written in two different ways. The first one shows the full name (example: C Major). It may also show as (C), which is the shorter version. The latter is the one that is more frequently seen these days, especially if you are checking out on chord diagrams from the web. However, the full name is typically used when spoken. The diagram is usually composed of six horizontal, as well as six vertical lines. The horizontal lines are the ones that represent frets, with the top line representing the nut down the guitar neck, depending on the individuals. Just a note, though, this refers to the “head end”, the “0”, or the “mechanical side”. The total number of horizontal lines may also vary depending on the needed number of frets to play the chord. The vertical lines, on the other hand, represent the guitar’s six strings. The line on the leftmost is the low E string, while the one on the right is the high E string. You can also find dots on a diagram, usually located in between two frets. You can number these dots to represent the strings. The numbers will serve as guide as to which fingers you also need to use for each of the frets, corresponding to each of the four fingers which will fret the strings. As a guide, the index finger is”1”, medium finger as “2”, ring finger as “3”, while the little finger is “4”. In some rare cases, the thumb can also be used, designated with a “T”. You may also notice a series of numbers that are found in between the nut, as well as the chord name. The line also represents what is generally found in most tabs. In most tablature versions, the strings are presented horizontally, not vertically, with the E string at the bottom. One very important thing about chords is that a single chord can exist in several different positions. On the other hand, the position for “C Major” is under the “open” chords category, which refers to chords that are composed of different notes that are played using open strings. This means that only two to four out of the six strings can be fretted. As such, they are a whole lot easier to play. Virtually speaking, there is an infinite number of chords that can be played. In a musical perspective, a chord can be composed of about three different notes that are played altogether. In fact, if you fret three different notes in a random way, you can already achieve a chord. Most of the time, the lowest note within a chord, is called the “fundamental”. Usually, it is with this note that we start playing a chord, or arpeggio. At the same time, it is this note that provides the name to the chord. These essential chords refer to “E Minor”, “A Minor”, “G Major”, “D Major” and “C Major”. These chords may be played in several different ways. Still, all of them are equipped with a characteristic that belongs under the same tonality, that is, of G Major, meaning you can still easily chain them altogether one after the other in any order, and it will still sound good. There are also some chords that are considered as complicated, such as the A Minor. In order to deal with the complications, you need to learn first how to place your fingers correctly. If the finger is incorrectly positioned, all you have to do is to reposition it. It would not be wise grinding all directions, as you may only feel uncomfortable, as well as impossible even to replicate. If you are not able to put your finger in place so that it will not touch adjacent strings, you can do some cheats. For instance, you can attempt to place it so that it touches a string fretted earlier already with the other finger. Avoid placing your fingers in a random way. It is best to determine the problem first, before attempting to fix it. There are some training exercises that you can perform in order to enhance your chord playing. It may be a difficult exercise, it is not advised for beginners. You may want to work on a few chords, memorizing them. With practice, in just a few days or weeks, you can see some improvements. Try to form a normal chord as you usually do. This time, however, avoid touching the strings first. Just let the fingers on top of the strings, above the frets. Once the fingers are there up in the air and on top of the strings, press them together, stop moving. You can then repeat this process. If you are successful in fretting the right strings, you can continue practicing over and over again. In order to be successful with the practice, it is fairly important to understand its use. It is best, therefore, to observe someone who is skilled in playing guitar. Do not be disappointed if you cannot get it right the first time. With practice, and with some help, you can eventually be successful. Let’s take a guitar and practice now!